Background: One way to improve the performance of hospitals, the largest resource-consuming units in the healthcare sector, is to continuously evaluate their performance. Objective: The current study assessed the performance of hospitals affiliated with the Kurdistan University of Medical Sciences using data envelopment analysis (DEA). Methods: This retrospective descriptive-analytic study used DEA to assess efficiency types (technical, managerial, and scale) in hospitals of the Kurdistan University of Medical Sciences (n = 12) in the years 2007 to 2011. The number of active beds, nurses, physicians (general and specialist), and other staff were inputs; inpatient admission and occupied bed days were outputs. Stata version 12 was used for data analysis. Results: The mean technical, scale, and managerial efficiency values were 0.85, 0.89, and 0.95, respectively. The highest and lowest slack inputs were nurses and active beds, respectively. Conclusion: The findings indicate that Kurdistan hospitals were less than appropriately efficient during the studied period. They also suggest that there is a capacity of about 15% for enhancing output in hospitals (compared with the most efficient studied hospitals) without increasing costs or inputs. Hajialiafzali H, Moss J, Mahmood M. Efficiency measurement for hospitals owned by the Iranian social security organisation. J Med Syst. 2007;31(3):166-172. doi:10.1007/s10916-007-9051-6. Kiadaliri AA, Jafari M, Gerdtham U-G. Frontier-based techniques in measuring hospital efficiency in Iran: a systematic review and meta-regression analysis. BMC Health Serv Res. 2013;13(1):312. doi:10.1186/1472-6963-13-312. Yaisawarng S. Performance measurement and resource allocation. Efficiency in the Public Sector. Springer; 2002:61-81. doi:10.1186/1472-6963-13-312. Kuntz L, Scholtes S, Vera A. Incorporating efficiency in hospital-capacity planning in Germany. Eur J Health Econ. 2007;8(3):213-223. doi:10.1007/s10198-006-0021-6. Tandon A, Lauer JA, Evans DB, Murray CJ. Murray CJL, Evans DB, eds. Health system efficiency: concepts. In: Health Systems Performance Assessment: Debates, Methods and Empiricism. Geneva: WHO; 2003:683-691. Goudarzi R, RjabiGilan N, Ghasemi SR, Reshadat S, Askari R, Ahmadian M. Efficiency measurement using econometric stochastic frontier analysis (SFA) method, Case study: hospitals of Kermanshah University of Medical Sciences. J Kermanshah Univ Med Sci. 2014;17(10):666-672. Kirigia JM, Emrouznejad A, Sambo LG. Measurement of technical efficiency of public hospitals in Kenya: using data envelopment analysis. J Med Syst. 2002;26(1):39-45. doi:10.1023/b:joms.0000023298.31972.c9. Jacobs R. Alternative methods to examine hospital efficiency: data envelopment analysis and stochastic frontier analysis. Health Care Manag Sci. 2001;4(2):103-115. Karimi S, Bidram R. Efficiency Estimation in General Hospitals of Isfahan University of Medical Sciences during 2005-2006 by Data Envelopment Analysis. Journal of Health Administration. 2009;12(36):39-46. Zere E. Hospital efficiency in sub-Saharan Africa. Evidence from South Africa. Helsinki: UNU/WIDER; 2000. Renner A, Kirigia JM, Zere EA, Barry SP, Kirigia DG, Kamara C, et al. Technical efficiency of peripheral health units in Pujehun district of Sierra Leone: a DEA application. BMC Health Serv Res. 2005;5(1):77. doi:10.1186/1472-6963-5-77. Kheirollahi H, Matin BK, Mahboubi M, Alavijeh MM. Chance constrained input relaxation to congestion in stochastic DEA. An application to Iranian hospitals. Glob J Health Sci. 2015;7(4):151. doi:10.5539/gjhs.v7n4p151. Ismail MA. Technical efficiency of sudan’s health institutions: a state-level analysis. Population. 2010;70:19922. Kirigia JM, Emrouznejad A, Cassoma B, Asbu EZ, Barry S. A performance assessment method for hospitals: the case of municipal hospitals in Angola. J Med Syst. 2008;32(6):509-19. doi:10.1007/s10916-008-9157-5. Akazili J, Adjuik M, Jehu-Appiah C, Zere E. Using data envelopment analysis to measure the extent of technical efficiency of public health centres in Ghana. BMC Int Health Hum Rights. 2008;8:11. doi:10.1186/1472-698X-8-11. Marschall P, Flessa S. Efficiency of primary care in rural Burkina Faso. A two-stage DEA analysis. Health Econ Rev. 2011;1(1):1-15. doi:10.1186/2191-1991-1-5. Mogha SK, Yadav SP, Singh S. Estimating technical and scale efficiencies of private hospitals using a non-parametric approach: case of India. International Journal of Operational Research. 2014;20(1):21-40. Barouni M, Rahbar A, Abrazeh A, Parsa H. The estimation of technical efficiency of public hospitals in Qom using data envelopment analysis approach. Q J Sabzevar Univ Med Sci. 2015;22(2):238-244. [Persian]. Meybodi Emami A. Principles of Measuring Performance and Productivity: Practical Application (Persian). 2nd ed. Tehran: Publishing Business Studies and Research Institute; 2005:10-15. Ghaderi H, Goudarzi R, Gohari M. Determination technical efficiency of hospitals affiliated with Iran University of Medical Science by data envelopment analysis (2000-2004). J Health Adm. 2007;9(26):39-44. [Persian]. Hatam N. The role of data envelopment analysis (DEA) pattern in the efficiency of social security hospitals in Iran. Iran Red Crescent Med J. 2008;2008(3):211-217. Bhat R, Verma BB, Reuben E. Hospital efficiency: an empirical analysis of district hospitals and grant-in-aid hospitals in Gujarat. J Health Manage. 2001;3(2):167-197. doi:10.1177/097206340100300202. Jat TR, San Sebastian M. Technical efficiency of public district hospitals in Madhya Pradesh, India: a data envelopment analysis. Glob Health Action. 2013;6:21742. doi:10.3402/gha.v6i0.21742. Pourreza A, Goudarzi G, Azadi H. Determination of technical efficiency of hospitals affiliated with Tehran University of Medical Science by the data envelopment analysis method: 1996-2006. Journal of School of Public Health and Institute of Public Health Research. 2010;7(4):79-86. Saber-Mahani A, Goodarzi G, Barouni M, Khakian M. Estimation of technical efficiency of general hospitals of Kerman University of Medical sciences by data envelopment analysis (DEA) method IN 2007. J Kerman Univ Med Sci. 2010;17(1):59-67. [Persian]. 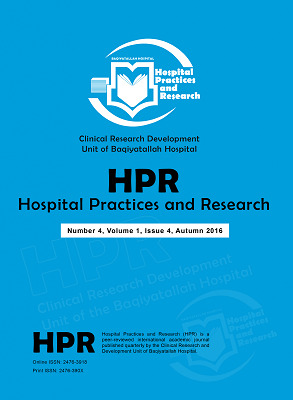 Najarzadeh M, Torabipoor A, Ghasemzadeh R, Salehi R. Assessment of hospitals efficiency by data envelopment analysis in Ahvaz in 2006-2010. Jundishapur J Health Sci. 2012;4(3):77-87. Askari R, Goudarzi R, Fallahzadeh H, Zarei B, Dehqani Tafti A. Efficiency appraisal of Yazd University of Medical Science hospitals by quantitative approach data envelopment analysis (DEA). Payavard Salamat. 2012;6(3):215-224. [Persian].